Pune is considered the cultural capital of Maharashtra, and rightly so. For tourists and locals alike, there’s plenty to discover in our city – from ancient Wadas to former Palaces, bustling markets, to warrior memorials. Here's a list of heritage buildings that go beyond Shaniwar Wada and a worth visiting. Pune Nagar Vachan Mandir is a 169-year old library, located in the heart of Budhwar Peth. Built in 1848, it burned down and was re-established as a library in 1879. It still stands as a functioning public library with a collection of over 50,000 books, and more than 3,000 registered members. The library houses an extensive collection of Marathi books and newspapers, but have introduced English ones as well. Visit it for a dose of old-world charm; admire their beautiful colonial-era architecture, towering portraits hung on the walls, high ceilings, and the lure of old books (nothing beats the scent of books, in our opinion). For a nominal fee of INR 30 per month, you could even sign up to become a member. Bonus points: they’ll even deliver books to your doorstep. To find out more, read our recommendation here. Vishrambaug Wada was built in 1807 and was the residence of Peshwa Bajirao II until his defeat at the hands of the British in the Third Anglo-Maratha War. Famous for its aesthetics: Alluring facades, hand-carved teak wood-work columns, pillars, ceilings, and more; it showcases typical features of Maratha architecture in earthy tones of red, brown and white. In addition to being a luxurious three-storeyed mansion for the Peshwa, Vishrambaug Wada was the original site for many educational institutions including a Sanskrit school in 182 and later, the Government Engineering College, Deccan College, Pune University, and Agricultural College. Currently, it houses a few offices of the PMC and a Post Office on its ground floor. A small museum of Maratha artefacts (for which there is an entry fee) was installed here by noted Maratha historian Babasaheb Purandare, and a handicraft shop by SMILE (Savitri Marketing Institution for Ladies Empowerment) is housed inside the Wada as well. Shinde Chhatri is a memorial to the 18th-century military leader and commander-in-chief of the Maratha army Mahadji Shinde. The location of the memorial shrine or ‘chhatri’ (meaning umbrella), marks the site at which he was cremated in 1794. It's right next to a temple dedicated to Lord Shiva, which Mahadji Shinde had ordered to be built. The architectural style is a fine example of Anglo-Rajasthani and is a stunning sight to see. Exquisite carvings on yellow and black stone, coloured window-panes, and old paintings and photographs make it a popular draw for tourists. The memorial went through a period of neglect but is now being restored to its original splendour by Mahadji Shinde’s descendants, the Scindia family of Gwalior. Formerly known as Reay Market, it was renamed Mahatma Phule Mandal Market in 1938. It was originally built by the British government in 1885 in the then-popular neo-Gothic style of architecture. And, also served as the municipality office for some time. 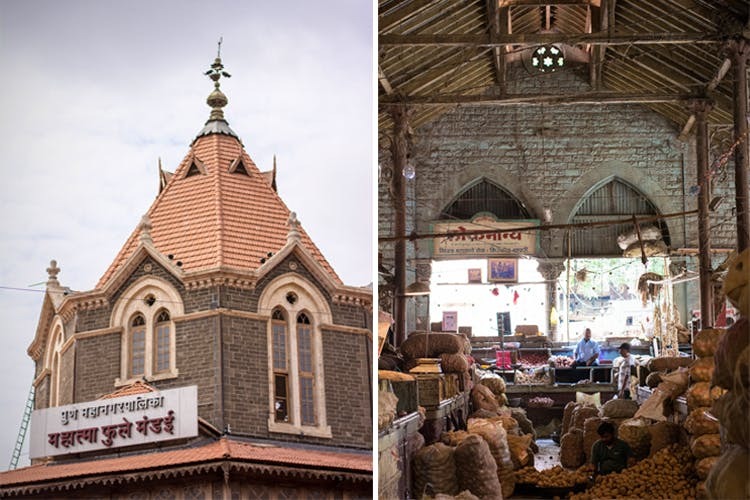 One of Pune’s largest vegetable markets, the prominent features here are the market’s octagonal structure with a central tower and eight entrances. The bustling market is packed with 526 stalls selling fruits and vegetables, and even articles for religious worship can be found here. During the Ganesh festival, the 127-year-old heritage market puts up their own Ganpati Mandal named Akhil Mandai Ganapati, which is one of the most famous and iconic mandais in Pune. Locals, migrants, people of different religions and backgrounds come together here and a visit here will give you strong, warm community vibes. Savitribai Phule Pune University (formerly, University of Poona/Pune) was established in 1949 and features a 411-acre campus, housing over 43 academic departments. In 2014 the university was renamed after the 19th-century eminent social reformer, activist, teacher, and poet Savitribai Phule, who also pioneered the first Indian-run school for girls in Pune in 1848. The current main building of the university (where it was relocated to in 1949), was built in 1864 and was formerly called Governor House (which was once the seasonal retreat of the Governor of Bombay}. When visiting the university's campus, don’t forget to check out 60-year-old Jayakar Library, which is famous for rare manuscripts, and hand-written multi-lingual books (more on that here). Of course, no tour of Pune goes without mentioning iconic sites like Shaniwar Wada, Aga Khan Palace, and the Pataleshwar Temple and Caves. If you’d rather do a one-day tour of historical sites in Pune, check out our recommendation for the Pune Darshan Tour here. For the adventurous and outdoorsy kind, don’t miss our guide to the top forts around Pune worth exploring, here.